Today, Butch and Sundance decided to turn the tables on Louise and I, and tried to knock us off in their own subtle way. As I’m sure you can decipher from our photos and posts, Louise and I spent a long time and invested a lot of thought and effort meticulously planning this trip. Doing so, we had planned on each leg averaging with a 6 hour drive, and then a day in between to take in the local sights. After Butch and Sundance arrived, that kind of went out the window. So our two busiest driving days were yesterday and today to split up 1000 miles while they were here to help shoulder the drive. They apparently were not amused. After 13 1/2 hours in the RV yesterday, we arrived to the hotel after bistro hours–whatever that even means–so we had to get pizza in the lobby without the FULL BAR their website clearly stated would accommodate us. The next morning, same said sketchy bistro served up fictious breakfasts, so we started the day hungry. And sober. Fargo came and Fargo went. No lunch. Now I like a good crudite platter as much as the next guy, but adulting in the back seat of camper with 9 kids and 4 controllers to the gaming system burns more calories than a couple of celery stalks. The children were so hungry they were foraging between the couch cushions, which is not a healthy practice on Day 16. They began peeling the Bananagrams for sustenance. They brushed their teeth extra long just for some sparkle berry juice residue. Butch and Sundance were unmoved by our plight. Hours later after two fainting spells and a massive orange juice spill which rendered us completely foodless–they relented and let us go through a McDonalds to the unsatisfaction of all. But retribution would soon be ours in three simple, yet totally terrifying words to a Dad. Bet that Fargo Panera doesn’t look that far off the Interstate now, does it, boys? We piled the 13 of us back into the RV this morning while it was still dark. It instantly felt like being snatched from the bosom of our West Yellowstone sanctuary and hurdled onto the harsh Interstate abyss. I can describe what reentry is like to you only in the following 2-word phrases. That’s all we’re capable of now. Hotel tonight better have a full bar and free Wifi. We have just spent the last four days in one of the most beautiful places on the planet. We have discovered and explored Yellowstone with more than a little help from our new friends of cabin staff, guides and locals. We saw the icons—Old Faithful erupted right at 5:38 as we dined at the Old Faithful Inn. We ate dinner at the Roosevelt Lodge where Teddy would stay, and we went to many different waterfalls and formations that I’d never even heard of. We saw hundreds of elk and bison; and even caught a glimpse of a lone coyote prowling through a meadow at sunset. We fished for trout in Lake Yellowstone (caught three but had to throw them back because they were cutthroats) and smelled the hot springs before we saw them bubbling away in a field or the side of a mountain. We saw colors I didn’t know existed including water so clear you could see the bottom of the river bed from yards offshore and crossed the continental divide several times. It was spectacular, but at the same time it was also the most natural thing in the entire world. The kids learned what a huckleberry tastes like, what a bison chip feels like when you step in it, and how good a sandwich can taste when eaten on a picnic table outside. We saw the first National Park at sunrise and at sunset; and I bet no one could decide which is more grandiose. One night on our way out of the park, we experienced a power outage that ran from Idaho Falls up to Bozeman. The town of West Yellowstone was without electricity for several hours, but you couldn’t tell because it stays so light for so late. We had s’mores for dinner (again) until the nice folks at the hotel came by with grilled burgers. We didn’t even notice or care when power was eventually restored later that night. All told, I think we looked up, out, in and around way more than we looked down at a screen. And that was perhaps the most beautiful sight of all. Day 12–Wolves, Bears and Marshmallows, Oh My! I know I’m behind on posting for a couple of days, but when your breath has been taken away so often, sometimes you need a minute to catch it. We arrived in West Yellowstone on Monday to an oasis we didn’t know we needed. Right away we went to the Grizzly & Wolf Discovery Center for a behind the scenes tour of the work they do to care for animals that can’t be returned to the wild. We actually got to hide food for the bears in their habitat, then watch (from a safe distance) as they went out and found it. Sort of playing Hide and Go Seek with bears who can’t rip your face off. A win-win. After that truly fascinating visit, we were whisked away (across the street) to the Explorer Cabins at West Yellowstone where clean the most friendly, accommodating staff awaited us with a built fire and S’mores. We went to dinner on a ranch nearby, and I don’t know if we’ve ever been happier to sleep in clean sheets that didn’t move along an interstate in our lives. The wolves sang us to sleep in the light of almost full moon. Author TraceyPosted on July 21, 2016 Categories ColumnTags Road Trip!, travel1 Comment on Day 12–Wolves, Bears and Marshmallows, Oh My! We have arrived on the planet Wyoming, and I won’t lie—it is a much friendlier people than our last universe. The youngest of a crew needed some medical attention today for an ear infection after enjoying a day at the native amusement; a waterpark at the Fairfield Inn. So we made a detour into the Cody, Wyoming hospital before camping in one of the prettiest landings yet. It’s actually kind of surprising that an ER visit only took 10 days to occur as our crew is battling numerous ailments at this point. Ear infections, stomachaches from a diet of Dr. Pepper and marshmallows, mystery rashes and I’m sure we are mere hours away from a rampant pink eye epidemic. I don’t know how much baby George will remember of this journey, but we must all make a vow to maintain the legend that he once went to the ER in Cody for something truly epic—like a rodeo injury or snake bite—and we’ll just keep the whole amoxicillin thing to ourselves. This state’s terrain is absolutely breathtaking; and it seemed that around every bend it changed into something more spectacular. The road to Yellowstone is an awe-inspiring tease for what’s to come here on the USS Spentourlives. Upon picking up our last passenger from the Rapid City airport, our baker’s dozen of adventurers is now complete. Our crew of thirteen in matching T-shirts made for an inconspicuous entrance into Mount Rushmore, which was our destination for the day. But we’re not really going for subtlety when we ask strangers to take our picture, so it was all good. Until Deadwood. What can I say about Deadwood? The signs that things were just a bit off were evident when we pulled into the campground and Sean immediately purchased the neighboring sites around us so we wouldn’t hit the RV next to us when we opened a window. The amenities weren’t exactly what were advertised on the website, but we got a bonus visit from a mountain lion in the middle of the night so I suppose we’re square there. After a rather sleepless night dodging local wildlife, we thought a day in the old western town would be fun. Deadwood is weird. It’s not Gatlinburg-esque in its corny, touristy and fun way. It’s not completely authentic even in its strange street reenactments of murders of old cowboys. It’s seedy. And not friendly. And a bit NC-17. And everyone seems to be drunk. Including the public trolley car driver who regards the schedule, designated stops and traffic laws as mere suggestions. And not even fun drunk on Louise’s white wine but an angry drunk on stale beer and whiskey from label-less bottles. You kind of fear for your life at all times and really hope you don’t die there so they don’t reenact your demise one day in the front of a Hampton Inn. You feel like everyone in town wants to stab you but not in the surly old cowboy way that can reach a resolution of mutual respect over a good poker hand and a shot; but more like the being on several FBI watch lists kind of stabbing in broad daylight over an imagined slight on Facebook or offense taken over a tacky T-shirt. And the only gambling we did was which communicable disease we’d contract from the public restrooms. We promised the kids that if we didn’t die by food poisoning from the inordinate number of All You Can Eat Crab places or the poison candy offered by the toothless woman at the bus stop, we would pull up stakes and head west a day early. It was the fastest camp break down to date. Good night from Gillette, Wyoming. The Badlands were an unexpected, awe-inspiring sight. Not a single picture could or has ever done it justice although we certainly tried through a myriad of lenses yesterday. Exploring that grandeur was not only a highlight of this trip, but certainly one of all my travels. Surprises like a field of wild prairie dogs and vistas around every bend will not soon be forgotten. What I do hope to forget is the rather tragic fly situation going on in western South Dakota. Being amongst its residents for the last week, I feel like they are a proud people–private by nature and not really apt to share their plight–but the insect situation is approaching dire. This plague is well past Pinterest solutions and in need of its own hashtag. Send fly traps. Our campsite succumbed and we tried the penny in the plastic bag of water trick–the flies broke them open and used the money to buy booze and party favors and invited more friends to the party. In desperation, we bought some weird contraption that–pardon my graphic and crude description–smelled like diarrhea but was so effective that we were willing to trade off the odor for the relief. Glue strips hung from the rafters and again, were absolutely disgusting, but so are gross flies. We were able to leave them behind, but the folks of SD need help, people. We made the trip to the famous Wall Drug for their free ice water and 5 cent coffee. After a couple of cups of that, the nickels might have been better spent in the plastic bags of water. We committed no felonies today. However, if looking this good after four days with campground hair and a glowing sheen from perspiration and bugspray is a crime, then we are guilty as charged, my friends. We traveled due north today through hundreds of miles of Iowa corn fields and farmland to the next pit stop of Sioux Falls. South Dakota has an 80 mph speed limit which didn’t exactly feel smooth in the big rig, so we brought it back down to a respectable 75. Shockingly, it was our shortest leg yet. Every campground we stay in has only been researched online back in February so like a box of chocolate, you never know what you’re going to get. (Except we’re camping, so you get a lot of toasted marshmallow filled ones.) We chose each campground based on location and whether or not they had cabins available; because yes, we are crazy, but not legally insane, and we knew we couldn’t sleep 13 in the RV. That criteria was crucial, and then the remaining details were bonuses. It’s kind of a give and take game. Like last night’s accommodations had an awesome jumping pillow for the kids. But Louise couldn’t turn on her phone at night in her cabin or she’d be swarmed by moths. In St. Louis, the cabins were awesome, but we were next to a train and a graveyard. Here in Sioux Falls, we have the best site at the place, but it shares the concrete slab with the laundry facilities and game room. Convenient, but I feel just a tad exposed. There’s a chimenea, but no natural boundary define our space. And kids I know aren’t ours keep raiding the quarter jar. I’d be worried that strangers would also be helping themselves to the contents of our cooler, but there’s only Louise’s Cupcake wine in there, and no one wants that. I may sleep with the Louisville Slugger close by tonight. Just in case the quarter-stealers want to play baseball in the middle of the night, of course. ~Three weeks, 3700 miles to two western National Parks through thirteen states in an RV with 9 kids and 48 bottles of vodka. ~If gas prices remain low, it will actually be quite an economical vacation. The vast majority of our expenses will come later for therapy, data overage charges, increased insurance premiums and detox. ~Packing for 13 people for a month in a trailer will be a challenge, but we get to eliminate things like privacy, any sense of personal space and vanity. ~You don’t need a special license or any specialized training to operate our vehicle. You do need a lot of Youtube watching, rubber gloves and a liability waiver from your travel partners from any future litigation. ~Yes, there’s always room for one more. 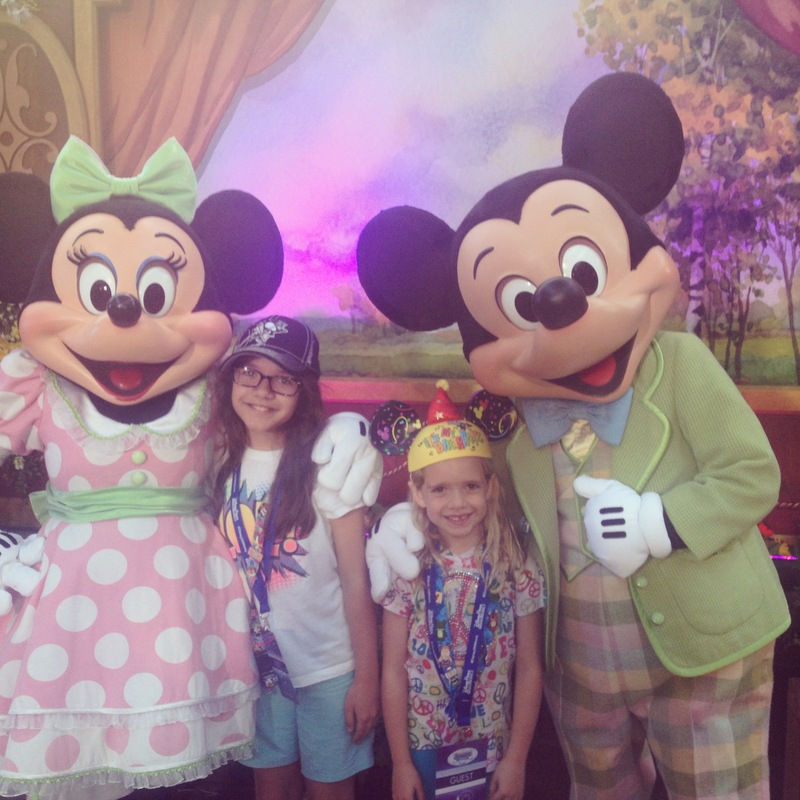 Last week I was lucky enough to have been invited to the Disney Social Media Moms Celebration. I attended with a friend and my two daughters, and it is truly an experience I will never forget. I had a wonderful time, met amazing people and learned a lot. To summarize a trip of this size and scope is almost a disservice, so I have attempted to compile the top 10 lessons I learned. 1.) Remember to bring the Fit Bit next trip. The massive step count will justify another Dole Whip. 2.) Never trash-talk a 7 year-old about who is going to puke first on Big Thunder Mountain Railroad. There are no winners in that game. 3.) Buzzfeed needs to issue a quiz on “What kind of Ride Line Person are you?” Answers will range from Personal-Space-Ignorer to Huge-Gap-Leaver. I will probably score, Why Yes, I am the Line Police, since both of the previous profiles seem to haunt me at every attraction. 5.) Those huge mylar balloons that they sell on Main Street will out-last the stand-by line at Peter Pan, a week’s hotel stay, hundreds of miles stuffed in a trunk, several seasons of “Good Luck, Charlie,” a forwarded power-point slideshow entitled, “FW: FWD: RE: FWD: YOU WON’T BELIEVE THIS KID!” from your grandmother and an Oscar acceptance speech. 6.) No one who hasn’t had their face on a jar of Smucker’s with Willard Scott on the Today Show knows who Mr. Toad is but everyone agrees his ride is little more disturbing than wild. 7.) Even though you may feel the same effects the next morning, “park-hopping” and “bar-hopping” are not interchangeable activities. 9.) Turn on the flash for selfies on Space Mountain. 10.) Just because parenthood can be serious business, childhood isn’t. There is this modern tendency for us to be so wrapped up in the responsibilities, expectations and journey of motherhood, that we can easily overlook the happy fact that a childhood is occurring in tandem. We can’t go to Disneyland everyday, but magic can be a daily event. Find it. Point it out. Laugh with it. Create, make, build, feed, read, appreciate, praise, worship, sing, breathe, adore, photograph, grow, enjoy, write, cry, memorize and wonder at it. The memories will last even longer than that mylar balloon.